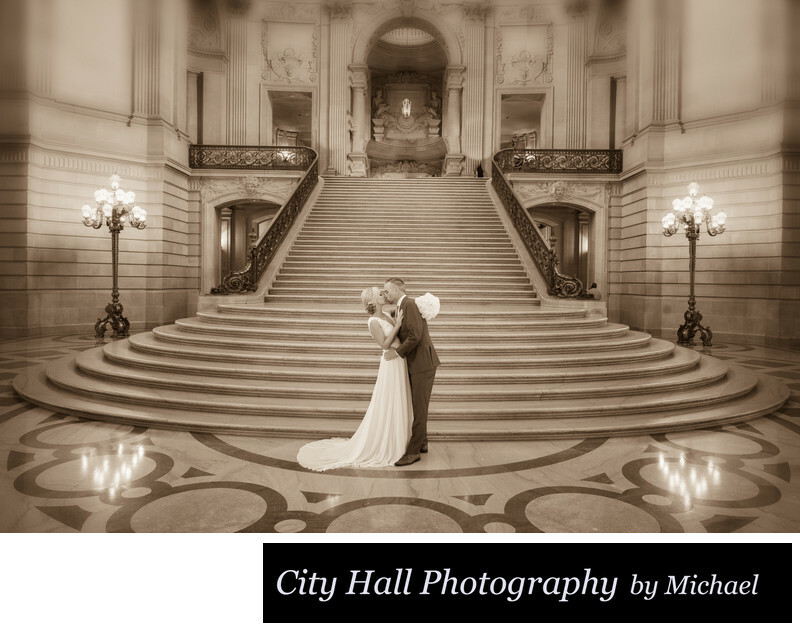 San Francisco Wedding image of the Grand Staircase at City Hall - Amy and Patrick City Hall Wedding Gallery - SF Tour and North Beach Reception. For some reason, the Grand Staircase at San Francisco city hall seems to look good when displayed in Sepia Tone. I have always liked the way it appears so I often make prints of it that way. Sometimes using a monotone type of display print helps to not distract your eye from the architecture. One of the reasons Black and White and Sepia are popular is because of the simplicity. When you look at this print your eye goes directly to the main subject (the bride and groom) and the to the stairs. At some point you focus on the lights and the reflection. If there were other colors in the photos, it might distract partly from these important items.